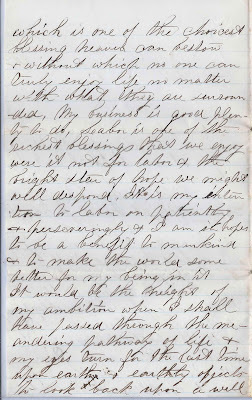 13 May 1867 letter sent by George Webster Cushman while he was working at or near Skowhegan, Maine, to his parents, Charles and Jane (Hayden) Cushman at Winslow, Maine. 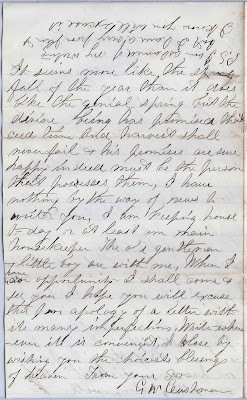 February 23, 1868 - a lengthy letter describing how he managed to save the shop during a fire that destroyed several other buildings; the letter seemed to be seeking peace with his parents after what apparently was a rift that caused him to move away, though he indicates that he feels the fault was not his. 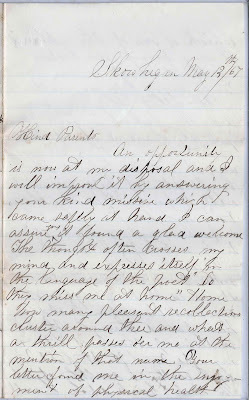 June 11, 1869 - a letter informing his parents that he has just married and that he and his bride will be visiting soon with a private team. Whatever rift there may have been, it was apparently resolved by the time of the 1870 Census, as George and his wife Lucy were listed in the household of his parents at Winslow, Maine. 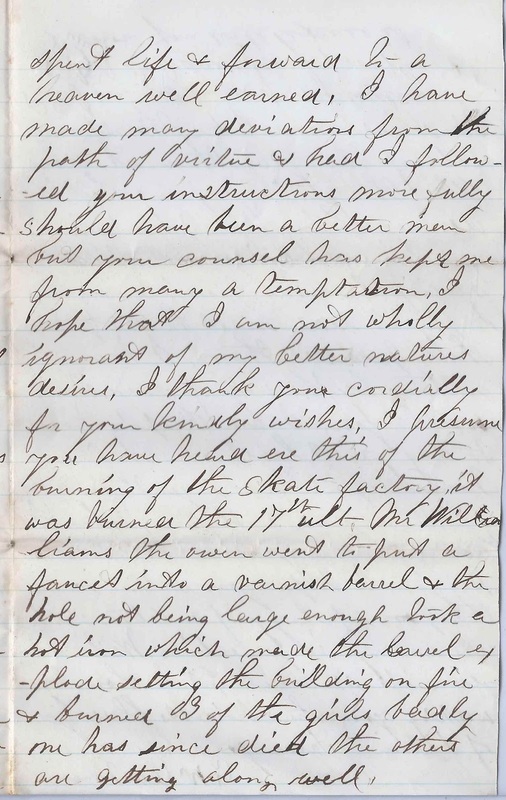 This letter describes a fire at a skate factory at which several women were burned, including one fatally. An opportunity is now at my disposal and I will improve it by answering your kind missive which came safely at hand. I can assure you I found a glad welcome. The thought often crosses my mind and expresses itself in the language of the poet. “Lo they miss me at home”. Home, how many pleasant recollections cluster around thee and what a thrill passes o’er me at the mention of that name. Your letter found me in the enjoyment of physical health, which is one of the choicest blessings heaven can bestow and without which no one can truly enjoy life no matter with what they are surrounded. My business is good, plenty to do, Labor is one of the richest blessings that we enjoy. Were it not for labor and the bright star of hope we might well despond. It is my intention to labor on patiently and perseveringly and I am in hopes to be a benefit to mankind and to make the world some better for my being in it. It would be the height of ambition when I shall have passed through the meandering pathways of life and my eyes turn for the last time upon earth and earthly objects - to look back upon a well spent life and forward to a heaven well earned. I have made many deviations from the path of virtue and had I followed your instructions more fully should have been a better man but your counsel has kept me from many a temptation. I hope that I am not wholly ignorant of my better natures, desires. I thank you cordially for your kindly wishes. I presume you have heard ere this of the burning of the skate factory. It was burned the 17th ult. Mr. Williams, the owner, went to put a faucet into a varnish barrel and the hole not being large enough took a hot iron which made the barrel explode setting the building on fire and burned 3 of the girls badly. One has since died. The others are getting along well. It seems more like the fall of the year than it does like the genial spring, but the devine being has promised that seed time and harvest shall never fail, and his promises are sure. Happy indeed must be the person that possesses them. I have nothing by the way of news to write you. I am keeping house today or at least I’m main housekeeper. The old gentleman and little boy are with me. When I have an opportunity I shall come to see you. I hope you will excuse this poor apology of a letter with its many imperfections. Write whenever it is convenient. I close by wishing you the choicest blessings of heaven. P.S. I am ashamed of my writing but I have a very poor pen and I know you will excuse it. 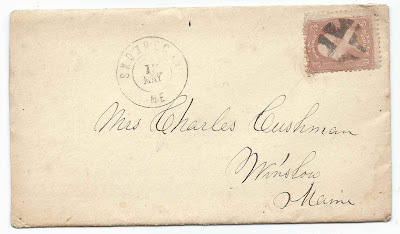 George Webster Cushman was born 9 March 1838 at Winslow, Maine, the son of Charles and Jane (Hayden) Cushman. From what I could tell, George's paternal grandparents were Joshua and Lucy (Jones) Cushman, and his maternal grandparents were Charles and Mary Polly (Howard) Hayden. 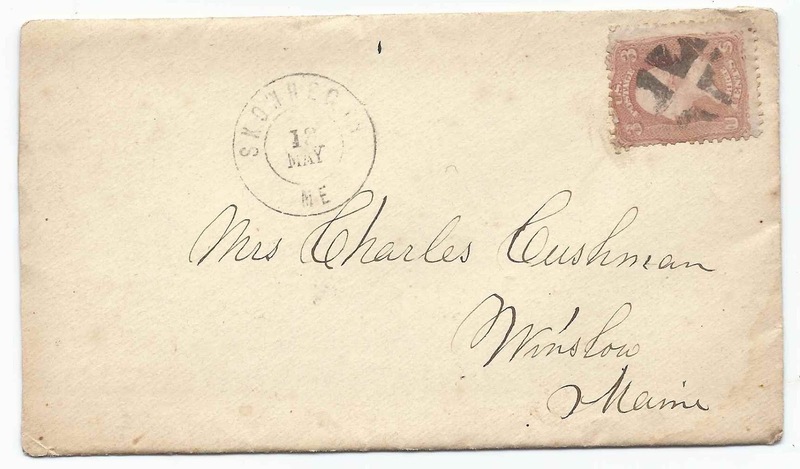 As another of the letters implies, George married Lucy Jane Ireland on 5 June 1869 in Somerset County, Maine, presumably at Skowhegan or in that area. 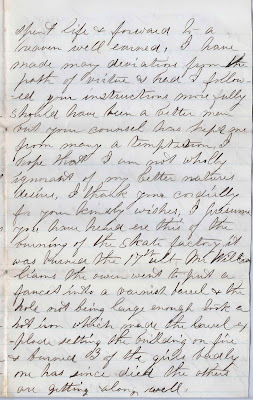 Lucy Jane Ireland was born 27 April 1840 at Chester, Maine, the daughter of Eleazer Colburn Ireland and Rhoda B. (possibly Wyman) Ireland. The family subsequently moved to the Skowhegan area where presumably George and Lucy would eventually meet. The couple had at least two children, sons Alvin W. Cushman and Robert Hayden Cushman. Interestingly, Alvin was living at Canon City, Colorado at the time of the 1900 Census. His maternal grandparents, Eleazer Coburn Ireland and wife Rhoda and at least two of their sons had moved from Skowhegan to Canon City at some point after the 1880 Census. 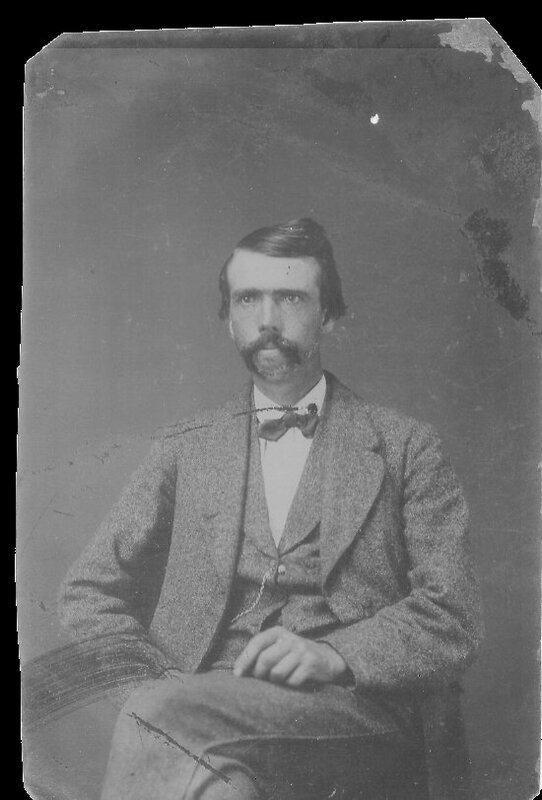 Eleazer Coburn Ireland and Rhoda died in Fremont County, Colorado in the 1890s. The 1910 Census of Bingham Canyon, Utah, finds Charles with wife Katie and a son and a daughter, the older of whom, Richard, has the surname Hodgins; he may have been Katie's child from a previous marriage. Katie was Catherine Farrell, born in Belfast, Northern Ireland about 1877. 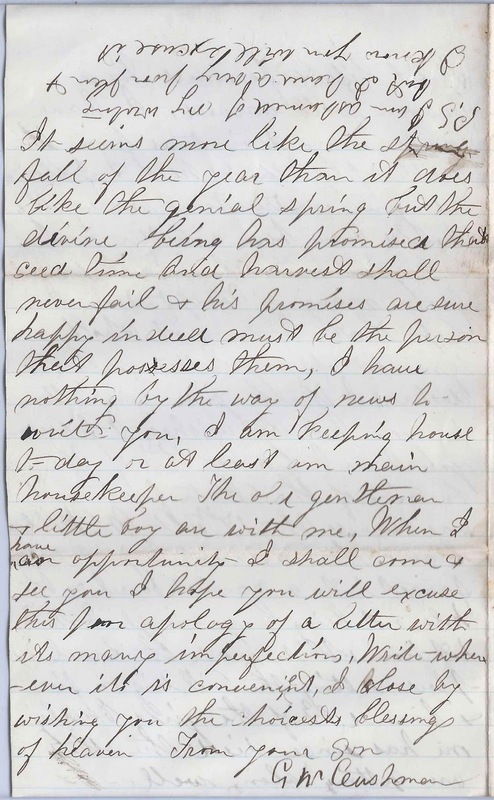 Charles and Katie moved back to Winslow, Maine, not long after that Census enumeration; they would have one more child, a son George. Joseph Hodgins apparently took Charles' surname at some point; he stayed in Utah and died there in 1970. The other son of George Webster Cushman and Lucy Jane (Ireland) Cushman, Robert Hayden Cushman married Marie Josephine Fecteau, daughter of Philmon and Amanda (Grenier) Fecteau. Marie Josephine was born at Beauceville, Quebec about 1896. They had at least one child, a daughter Ruth Gertrude Cushman. I found an online source detailing the Skowhegan area people and families who left Skowhegan for other areas. Lucy's father and two of her brothers are mentioned: Coburn, Alvin (for whom her son was named) and Charles. Brother Prentice also went west but is not mentioned. 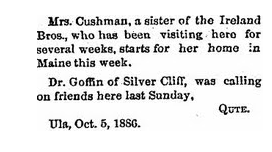 A Colorado Ireland relative has graciously forwarded the image of a clipping that indicated that Lucy Jane (Ireland) Cushman had visited her brothers in Ula, Colorado in 1886. She also provided images of tintypes of Lucy's brothers Prentice Floyd Ireland and Charles Judson Ireland. Prentice Floyd Ireland was born about 1845 in Maine, and married Mary Frances Presho, daughter of William and Mary (Collins) Presho, in Lancaster County, Nebraska, on 21 September 1877. 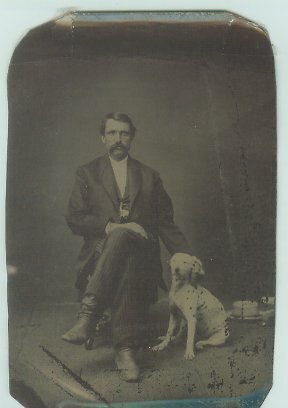 Prentice died about 1888 in Colorado, possibly in the Wet Mountain area. His modern day family members have searched in vain for his resting place. 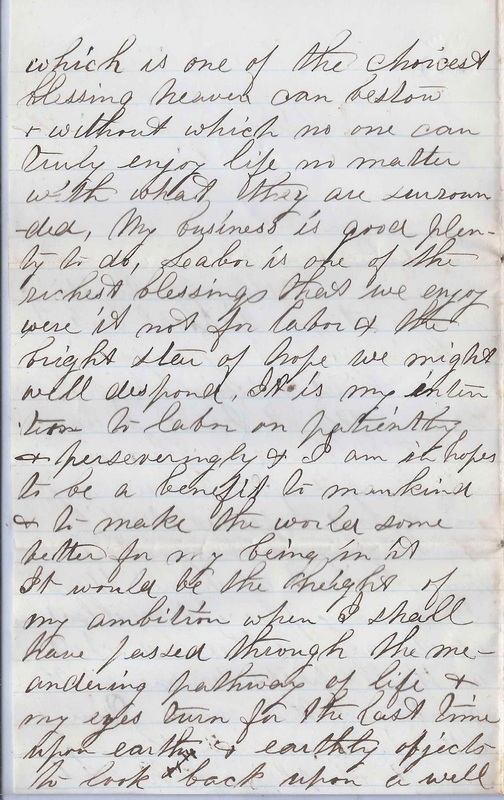 Charles Judson Ireland was born about 1851 at Skowhegan, Maine and went west to Colorado with his brothers. While there, he married Hattie, with whom he had three children: David Elton Ireland, born 1 September 1881 in Colorado; Lucy Ireland and Bessie Ireland. Charles was single and working as a ranchman in the 1880 Census of Wet Mountain Valley, Colorado, so his marriage to Hattie, who was born in Nebraska, according to Census records, must have occurred very soon after that enumeration. 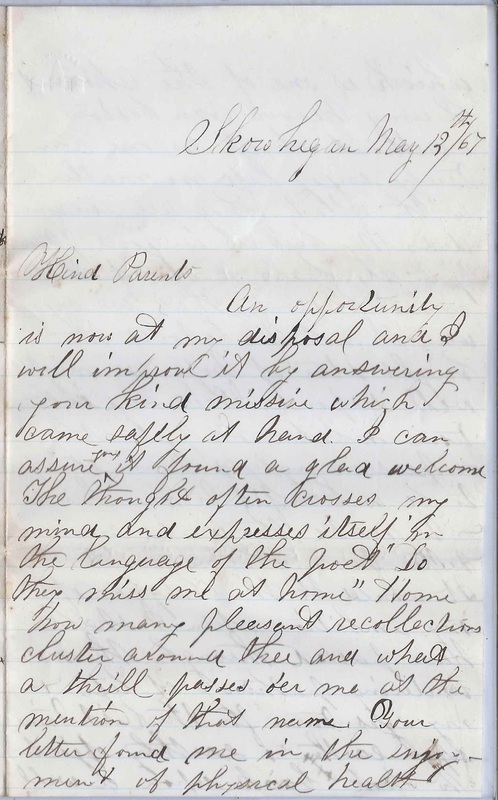 Hattie had apparently died or moved away before the time of the enumeration of the 1900 Census of Fort Garland, Colorado, where Charles was living with his three children. I haven't been able to find anything about her, other than from the 1885 Colorado Census in which she indicated that she was born about 1865 in Michigan and that her father was from England and her mother from Wales. On 8 December 1909 at Winslow, Maine, Charles married Alice Belle Files, daughter of George W. Files and Helen (Smiley) Files. Alice was born about 1860 at Wales, Maine. According to their marriage record, Charles was then living in New Mexico and working as a lumber dealer. If you have corrections or additions to the information above, please leave a comment or contact me directly. Thanks!